The seminar The Austrian School in Historical Context: Its Rebirth and Continuing Relevance presented by the professor and economist Richard Ebeling, is a group of sessions where he discusses the pertinence of the several contributions the Austrian School of Economics made during the 20th century. In this session, the professor Ebeling presents the Austrian Business Cycle Theory and the case for Monetary Freedom. He begins by exposing the Austrian economist Carl Menger’s explanation of the origin of money, which he said to be one of those “spontaneous” institutions of the social order. Ebeling discusses the purchasing power of money over goods, the changing mechanism of the money and its effect in the economy that leads to a business cycle. The uniqueness of money is that it has not one price, money has as many prices as goods against it trades”. The Austrian economist realize that money is not neutral if the supply varies and some individuals will receive greater quantity of money before other in temporal sequence, so they studied money’s non-neutral effects. Friedrich Hayek, based on Ludwig von Mises arguments, presents his studies of Monetary Expansion and the Business Cycle, which he describes as an inflationary “bubble” followed by an economic downturn and a depression. What Mises and Hayek and other Austrian economists have argued is that this money creation in the lower rate of interests has created an illusion, the impression that if there’s actual more availability unspent resources, to undertake and sustain investment projects that it’s actually the case”. Ebeling explains how inflation is created in the United States with the Federal Reserve Policy and the Federal Government's Budget Deficits. Due to this impression of new money, the rate of interest goes down and it starts creating a bubble of non-existential capital with more longer term investments. 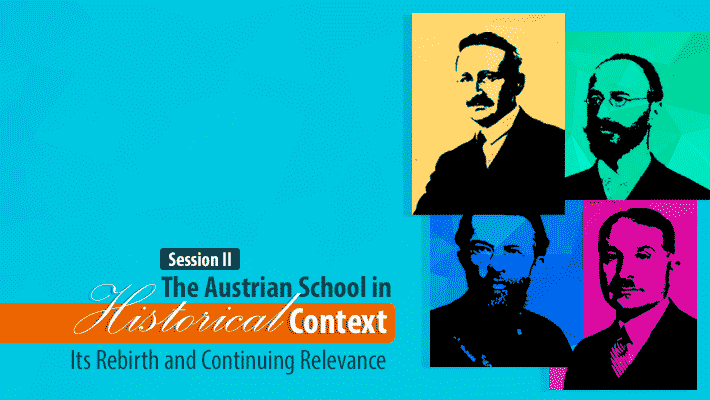 Watch the entire collection of The Austrian School in Historical Context: Its Rebirth and Continuing Relevance!